What an inspiring example! People united and got their voices heard. They forced the US government to take measures towards finding the cure for AIDS. This is a large-scale victory. Before that the public didn’t care about this disease, but these courageous people made it clear that they have a sound voice and that their call to fight AIDS was heard. Now there are significant funds available for research into AIDS, there are large private foundations, and full public support. We have to do the same thing for aging. We need our voices to be heard. That’s why we need to speak. We need to stop thinking that one person can’t change anything, that nothing depends on one person. This is a looser attitude. Every voice counts. We need to combine efforts in the common fight against the plague of the XXI century – aging. 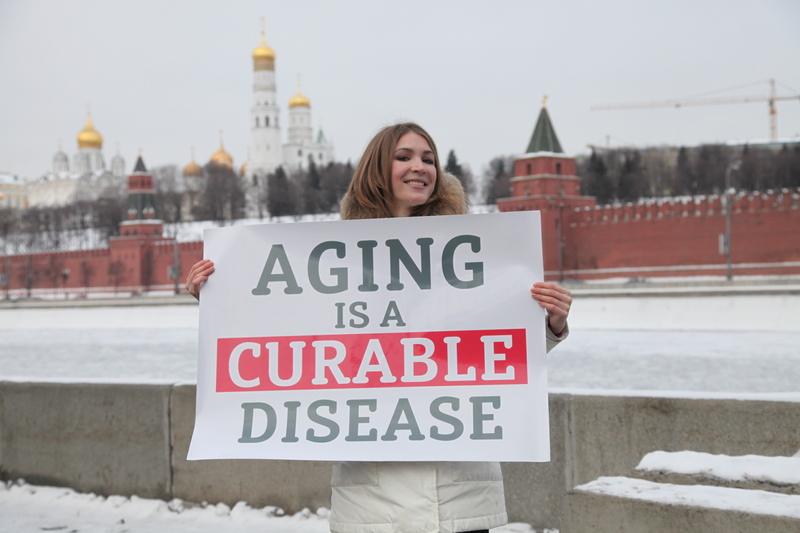 I, Maria Konovalenko, leader of Longevity Party, call to fight aging on a global scale. Aging is a disease that needs to be cured. Eliminating aging will lead to much longer and healthier lives, to fulfilling your goals and desires, to self improvement, wealth and will give you much more happy days with your family and loved ones. Fighting aging is the first step to radical life extension. Everyone who believes aging has to be defeated, upload your pictures with posters like this one in front of memorable places in your city. It will be nice to have a gallery of places where people are vocally advocating longevity. We have created the Roadmap to Immortality – a timeline of events that will lead to indefinite human lifespan extension. Some of these evens can happen simultaneously, some separately, some even already happened. I invite everyone to express their opinion, add to the Roadmap, make it more detailed. We need more authors, please, join!